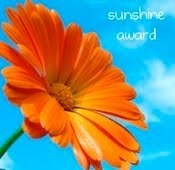 ☯ Luna Moonis ☯: The Sunshine Award! I can tell blog awards are about to get seriously popular - they're everywhere at the moment! You're not the only one if you've never heard of The Sunshine Award though, this is the first time I've ever seen it! I was tagged by the lovely Ali from Zombies Wear Eyeliner - her blog's great so check it out now, go go go! 2. Answer 10 questions about yourself. These are below. I'd change my teeth and I'd probably make myself more confident. I find questions like this, about music, the hardest! One of my favourite songs is Naive by The Kooks, All Over Town by The Kooks, What's my Age Again by Blink 182, Kiss With a Fist by Florence & The Machine... the list of my favourite songs could go on! 3. One part of your life, a memory, action, etc. that you could delete from your brain? Hmm... I haven't really had many bad experiences throughout my life so I'm really pretty lucky with that! I honestly can't think of anything, haha! 4. What generation do you wish you were a part of? 50's and 60's - I was born in the wrong era! 5. What was your favourite childhood toy? I used to love Betty Spaghetti and Polly Pocket!! Obviously I loved Barbies too! 6. What is your favourite household chore? I don't have a chore in particular that I enjoy, but I love just tidying rooms in general! My dad cooks tea most days and he's THE messiest cook, so I end up having to tidy the entire kitchen every night. I wouldn't enjoy if I didn't have my iPod though, I just turn it up and spend 50% of my time cleaning dancing about and singing - that's why it takes me so long! I'd love to go to University in Paris to study something in fashion (Ive not entirely made up my mind) and hopefully stay there to work in Fashion Design or Fashion Journalism! 10. What's the ugliest car you've ever driven and were you embarrassed to drive it? Electric Daisies - I don't know how this blog hasn't got way more followers!! Congrats! I hope you get to go to U of Paris...sounds amazing! I still don't really get these blog awards, so bloggers start them themselves?